Delhi is the capital city of India. It is historically and culturally connected to both the Upper Doab of the Yamuna-Ganges river system and the Punjab region. It is bordered by Haryana on three sides and by Uttar Pradesh to the east. It has a population of about 16.75 million, making it the second most populous city and second most populous urban agglomeration in India and 3rd largest urban area in the world. The NCT and its urban region have been given the special status of National Capital Region (NCR) under the Constitution of India's 69th Amendment Act of 1991. The NCR includes the neighbouring cities of Faridabad, Gurgaon, Noida, Ghaziabad, Neharpar (Greater Faridabad), Greater Noida, Bahadurgarh, Sonepat, Panipat, Karnal, Rohtak, Bhiwani, Rewari, Baghpat, Meerut, Alwar, Bharatpur and other nearby towns. 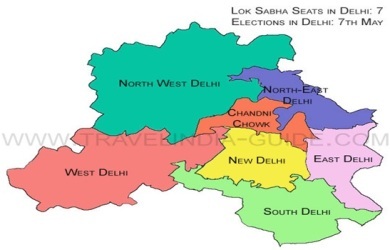 A union territory, the political administration of the NCT of Delhi today more closely resembles that of a state of India, with its own legislature, high court and an executive council of ministers headed by a Chief Minister. New Delhi is jointly administered by the federal government of India and the local government of Delhi, and is the capital of the NCT of Delhi. Electronics, Light Engineering Machines, Automobile Parts, Sports Goods, Bicycles, PVC Goods, Footwear, Textile, Fertilizer,, Medicines, Hosiery, Leather Goods, Software etc. Read more:data on the economy of Delhi , festivals of Delhi , facts about Delhi , Most interesting facts about Delhi , Gk , General Knowledge , Gk on Delhi , minerals in Delhi , natural resources in Delhi , dances of Delhi , Delhi language , Delhi festivals , Delhi tourist attractions , Delhi facts , Union Territories Of India , Monuments in delhi , karol bagh , akshardham delhi , delhi’s points of interest , humayun's tomb , delhi tourism red fort of delhi.